Dreaming spires, unspoiled countryside and rich history: Cambridgeshire is rightly celebrated by boffins, residents and visitors alike. The East Anglian area was first settled by the English in the 6th century by bands of Angles, and it was later recorded in the Domesday Book as “Grantbridgeshire” – a reference to the river Granta. Cambridgeshire has a proud history of agriculture, with the Domesday Book noting over 90 mills and numerous fisheries, and by the 14th century it also had a flourishing wool industry. Poverty struck following the dual blows of Black Death and the Wars of the Roses, but the area soon recovered. By the 16th century, Stourbridge Fair was one of the largest in Europe, and the races at Newmarket, on the Suffolk/Cambridgeshire border, were similarly admired. 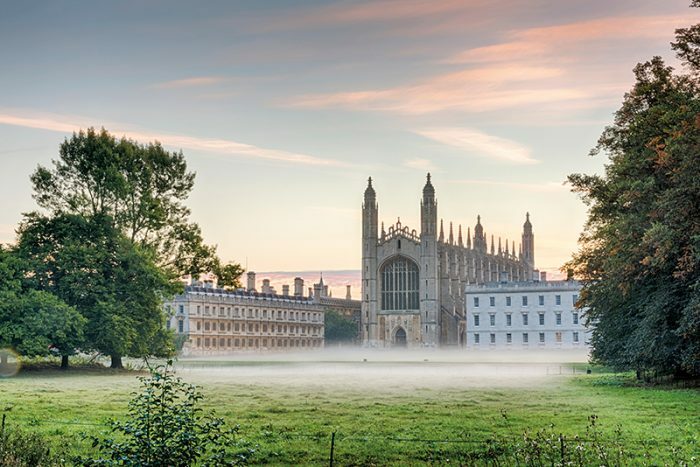 As well as the dramatic scenery of the Fens, the county boasts monumental structures such as Ely Cathedral and the Wimpole Estate, as well as the distinctive colleges of its world-renowned university – home to gown-clad students and tales of famous alumni. But you don’t need a degree to enjoy Cambridgeshire’s sights, from the lush farmland and myriad waterways – perfect for brisk winter walks – to the varied architecture and historic treasures. The cathedral has a rather turbulent history. Etheldreda, daughter of the King of East Anglia, built a monastery on the site in the 7th century, but it was destroyed by the Danes 200 years later. The present building became a cathedral in 1109, only for King Henry VIII to dissolve its monastery in 1539. However, it’s since been diligently restored, including contributions from architect George Gilbert Scott. Today, the monumental Romanesque building is the seat of the Bishop of Ely, and particularly admired for its distinctive central octagonal tower and stained glass museum. Combine sightseeing with a special Christmas service, from carol concerts to an atmospheric Midnight Mass. The Lord Protector’s family home offers a fascinating glimpse into the domestic life of the English revolutionary. Cromwell and his family moved to Ely in 1636, inhabiting this 13th-century home; the current kitchen dates from around 1215. The parlour recreates Mrs Cromwell working at her embroidery in front of the fire, while the study shows Cromwell busy at his desk, and the bedroom offers a tableau of his deathbed scene – the latter room is rumoured to be haunted. There’s also an exhibition detailing the English Civil War, period toys and, on 29 January, a historical fair – ideal for souvenir shopping. The iconic chapel is a superb example of late Perpendicular Gothic architecture, with the largest fan vault in the world. Building was started by King Henry VI in 1446 and took a century – and several monarchs – to complete, complicated by the tempestuous Wars of the Roses. King Henry VIII was responsible for the stained glass windows and rood screen, the latter celebrating his marriage to Anne Boleyn. Today, the chapel is home to worshippers and the college’s celebrated choir, whose Festival of Nine Lessons and Carols service is broadcast to millions via the BBC every Christmas Eve. The largest Oxbridge college in undergraduate numbers, Trinity has turned out six British prime ministers, physicist Sir Isaac Newton, poet Lord Byron (who purportedly kept a pet bear here), philosophers Wittgenstein and Bertrand Russell, the “Cambridge spies” Philby, Burgess and Blunt, and the current Prince of Wales. It was founded by King Henry VIII in 1546 by combining Michaelhouse and King’s Hall colleges, and most of its major buildings date from the 16th and 17th centuries, including Sir Christopher Wren’s library, the chapel and the Great Court – the latter being the site of the student run, as portrayed in Chariots of Fire. Farm Café or Stable Kitchen. The village of Duxford became a fighter airfield in 1925, and, on the outbreak of the Second World War, home to three RAF squadrons. It saw considerable action during the Battle of Britain as an RAF sector station, and later hosted the US Air Forces responsible for daylight bombing of Germany. The Imperial War Museum requested permission to use one of the airfield’s hangars in 1969, and Duxford soon became a valued outstation of the museum. The site now houses an impressive collection: nearly 200 aircraft, military vehicles, naval vessels and artillery, as well as film, photographs and other artefacts. The idyllic village is enjoying renewed popularity thanks to the TV series, but its history stretches back to the Domesday Book, where it’s listed as “Grantesete”. There are ancient ties to Cambridge colleges, and, thanks to those, it’s reported to house the highest concentration of Nobel Prize winners in the world. Poets Rupert Brooke and Byron visited – the latter’s student swim giving the name Byron’s Pool to its nature reserve. It’s a tad chilly for swimming now, but do try the Boxing Day barrel rolling: teams race up and down the Coton Road with a wooden barrel, before repairing to the local pub. The first nature reserve to be cared for by the National Trust after a parcel of land was donated by Charles Rothschild in 1901, Wicken Fen offers a glimpse of Cambridgeshire’s lost fenlands. With huge skies, flowering meadows, verdant sedge and reedbeds and an abundance of wildlife, including rarely seen bitterns, hen harriers and water voles, the melancholic landscape can be explored from the safety of an all-weather boardwalk with wider areas being opened to the public by the Wicken Fen Vision project. Although the landscape feels wild, in truth it has been managed by humans for hundreds of years – the first recorded sedge harvest took place in 1414 and the practice takes place for thatching roofs to this day. Highland cattle and Konik ponies offer another picturesque way of managing the landscape and the last surviving wooden windpump of the Fens, restored in 1956, is a reminder, too, of a bygone way of life. In 1816, the 7th Viscount Fitzwilliam bequeathed to the University of Cambridge his vast library and art collection, plus £100,000 to erect a museum to house them. George Basevi designed the Founder’s Building, which opened in 1848, and it’s now – in its bicentennial year – recognised as one of the finest small museums in Europe. The collection has grown through gift, bequest and purchase, adding to an already impressive offering. Highlights include masterpieces by Titian, Van Dyck, Gainsborough, Turner, Monet and Renoir, plus Japanese woodblocks, 500 folio albums of engravings, 130 medieval manuscripts, and autograph music by Handel and Purcell. Famous for its pretty tearoom overlooking the river in Ely, the floral print furnishings and wallpaper at Peacocks match its wisteria-clad exterior. The family-run business added two spacious B&B suites, each with its own living room, in 2013. Homely and individual the two suites – the Brewery House and the Cottage – feature a king-sized bed, antique furniture and an en suite bathroom (or shower-room). Start the day with a healthy fruit granola, but when it comes to cream teas later in the day, resistance is futile. Converted from old university buildings, Hotel du Vin, just two minutes’ walk from the Fitzwilliam Museum, offers visitors the opportunity to enjoy an insider’s view of Cambridge’s architectural treasures without the need to live like a student. With roll-top baths, custom-made beds and Egyptian cotton sheets, the 41 rooms include among their number the outstanding Cinema and Basement suites – the latter boasts such original features as a bread oven and glass-topped well, the former a private cinema. Explore the Grade II-listed building’s nooks and crannies – the vaulted cellar bar is well worth a peek – or sink into a sofa with a nightcap after exploring Cambridge’s lovely cobbled streets. Standing in the shadow of a lofty horse chestnut, the Crown Inn, with thatched roof and honey-coloured stone, wouldn’t look out of place in a period drama or on the front of a chocolate box. However, this bustling country pub is no history piece, but a living, thriving local hub. Not far from the village green in Elton, near Peterborough, the 16th-century building has retained its beamed ceilings and flagstone floors, without sacrificing contemporary comfort or style. Home-cooked food by chef-owner Marcus Lamb is locally sourced and includes plenty of traditional pub fare. The baronial Elton Hall is just a mile away or visit Fotheringhay Castle, just upriver, where Mary, Queen of Scots lost her head in 1587. Or snuggle up by an open fire with a pint of Black Sheep.